Nevermind that Republicans in control of the federal government since 2017 were unable to ensure the solvency of highway and transit funds for years to come. The Beltway intelligentsia is certain the elusive long-term infrastructure funding bill President “Builder-in-Chief” promised to deliver will be approved during the next Congress. Transportation leaders agree. “I think it was Henry Ford [who] used to say, ‘If you think you can, or you think you can’t, you’re right,’” Sen. Tom Carper (D-Del.) told Transport Topics after the Environment and Public Works Committee brought in three infrastructure stakeholders on Nov. 28 to strategize funding for urban and rural projects. The top Democrat on EPW is among a cadre of senior lawmakers, including EPW Chairman John Barrasso (R-Wyo. ), who are beaming with optimism about the GOP-led Senate’s ability to clear long-term transportation funding legislation within the next two years. The Senate will have help from a Democrat-led House and President Trump leading the sales pitch to the American people. Joe Biden used to say, ‘All politics is personal.’ And we got a good rapport here and we’ll build on that. 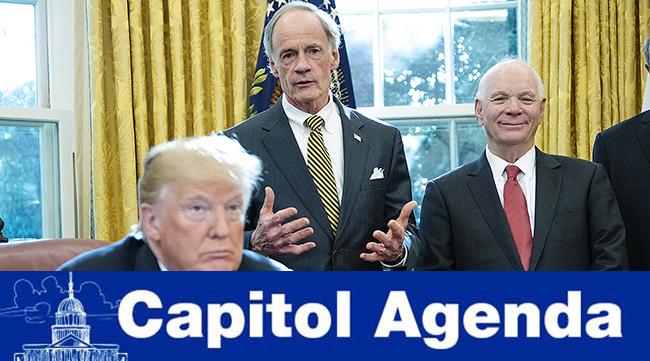 Carper noted his friendly relationship with the panel’s Republican leadership and he said he directed his transportation infrastructure staffers to meet with their counterparts prior to the start of the next Congress. Besides optimism, a sense of urgency will need to take hold of Carper’s colleagues if they are to advance some type of multiyear highway bill by the time the current one expires in two years. Lawmakers have acknowledged there isn’t time to waste. State departments of Transportation also tell Congress they can’t afford to delay big ticket highway projects simply because they lack a reliable funding partner in the federal government. All we need is funding, funding, funding. Dec. 4, 8:30 a.m.: Fedscoop hosts its Public Sector Innovation Summit. Speakers include CIA CIO John Edwards; Baltimore Mayor Catherine Pugh; and Dave Shive, CIO of the General Services Administration. Dec. 4, 9 a.m.: The U.S. Department of Energy’s Office of Fossil Energy hosts a meeting of the National Petroleum Council. Speakers include Energy Secretary Rick Perry. Dec. 4, 9:30 a.m.: U.S. DOT’s Office of the Secretary hosts a meeting of the Advisory Committee on Travel and Tourism Infrastructure. Dec. 4, 2 p.m.: U.S. DOT hosts a meeting of the Saint Lawrence Seaway Development Corporation advisory board. Dec. 4, 7:30 p.m.: The Newseum holds a panel discussion titled, “The Search for Balance in the Digital Era.” Speakers include Rep. Tim Ryan (D-Ohio). Dec. 5: National day of mourning for President George H. W. Bush. Dec. 5, 8:30 a.m.: The Atlantic hosts a summit on infrastructure. Speakers include House Transportation and Infrastructure ranking member Rep. Peter DeFazio (D-Ore.). Dec. 6, 11 a.m.: The National Academies of Sciences, Engineering, and Medicine unveils a congressionally mandated report about the Interstate Highway System to recommend options and funding opportunities for infrastructure. Dec. 7: Funding authority for several federal agencies expires. CLINIQUE: After years in limbo, a final rule became effective in November allowing medical examiners — in consultation with a truck driver’s treating clinician — to decide whether an insulin-treated diabetic driver is qualified to get behind the wheel. HAUL NO: The decision by General Motors to cease production at five of its factories in the United States and Canada will have consequences for trucking companies that serve those plants. LAST FRONTIER: Incoming Alaska Gov. Mike Dunleavy has announced that John MacKinnon will serve as the next commissioner of the Department of Transportation & Public Facilities. Senate legislation regarding autonomous vehicle policy may hitch a ride on the omnibus, insiders tell Transport Topics. Si Se Puede. Remembering former transportation appropriator, the late Rep. Ed Pastor (D-Ariz.). I have known Sam Graves since I came to Congress, and in that time I have learned that no one has as much knowledge and passion for the issues before the Transportation and Infrastructure Committee as Sam. — Outgoing T&I Chairman Bill Shuster (R-Pa.) on Nov. 30. Graves was selected as the committee ranking member for the next Congress. Will the real H.W. please stand up?